Riding a horse is a lot like life. There are periods of excitement and sheer terror. There are moments of great success. And then there are times you have to pick yourself up off the ground and dust off your pride. But mostly it is calmly walking when you are neither high nor low; simply enjoying the moment. Life mirrors this pattern, and just like riding a horse, when things start to look a little too rosy life throws you a buck and it’s not whether you fall off that matters but whether you get back on. 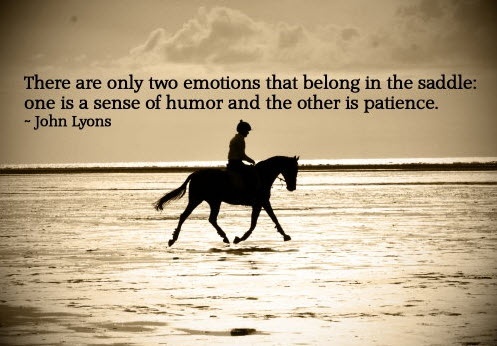 John Lyons, a well-respected horse trainer, once said, “There are only two emotions that belong in the saddle; one is a sense of humor and the other is patience.” As someone who has been blessed to spend their life around horses, I cannot help but think that truer words have never been spoken. If you aren’t quite as familiar, horses are essentially 1200lb toddlers. Imagine the last temper tantrum your child, nephew, cousin, or grandchild threw…? Supersize that and add in the danger of hooves and you can imagine why humor and patience is so important. “There are only two emotions that belong in the saddle; one is a sense of humor and the other is patience.” Each time I read Mr. Lyons quote I cannot help but think how much it sense it makes when you change the subject; for example, ‘there are only two emotions that belong at work; one is a sense of humor and the other is patience’. Go ahead. Try other subjects: in life, at school, with in-laws, with children, in rush hour traffic, etc. They all make sense, which leads me to conclude that humor and patience are vitally important to all aspects of life. If patience and humor are so important to this ride we call life are they equally important to how a person conducts business? ‘There are only two emotions that belong in business; one is a sense of humor and the other is patience’. I am inclined to agree with Mr. Lyons’ augmented quote. You need a sense of humor to be able to laugh at the inevitable struggles and failures that accompany running a small business. And you need the patience to be able to address and solve them. Humor and patience allow a business owner to enjoy the milestones and manage the setbacks. Even with all the patience and humor in the world life can still buck you off and leave you in the dust; remember to get back up. Where I come from no one can become a true cowboy or cowgirl until they’ve fallen off a horse and everyone wants to be a cowboy. So get up, dust yourself off, laugh, move on, and next time you’ll be better prepared for the ride.